NEWS REPORT: The most experienced player in the current Danish national team, Michael V. Knudsen, has decided to bid farewell to the national team. Denmark's test match agains Norway in Aalborg on Friday, 4. April will be last appearance in the Danish jersey for 35-year-old line player Michael V. Knudsen. "Of course, it is a difficult decision to say goodbye to an era, in which I have had so many unique experiences, personally as well as with the team," said Knudsen. "However, I feel that the time is right now, when the national team is going to change its coach, and I'm going to move home to Denmark with my family to start a new chapter in Bjerringbro-Silkeborg." Knudsen currently plays for VELUX EHF Champions League quarter-finalists SG Flensburg-Handewitt and will join the Danish league club Bjerringbro-Silkeborg after this season. Michael Knudsen is the player with the second largest number of internationals for Denmark ever. He has appeared 244 times for his country, and this number of appearances is only topped by Lars Christiansen's 338 internationals. He was part of the Danish team who won the EHF EURO 2008, while an injury was the reason why he missed Denmark's second EHF EURO triumph, in Serbia in 2012. Knudsen was also part of the Danish outfit who won the silver medal at the EHF EURO 2014 in Denmark in January this year. "Knudsen is nothing less than an institution in Danish handball. He is the quintessence of the values we want to represent," Denmark's national coach Ulrik Wilbek said in an official statement released by the Danish Handball Federation on Monday. "He always commits himself 100 per cent, when he is on the court, and outside the court his winning manners make him a person, whom everyone around him sets extremely high. An outstanding athlete," Wilbek added. 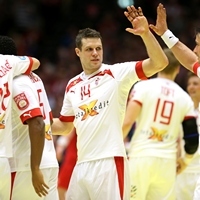 Michael Knudsen's goodbye to the national team may mean a certain shortage of available line players for the Danish team, as THW Kiel's René Toft Hansen has cancelled his appearance from the Golden League this week, as he wants to consider his future in the national team, as he put it.